The Texas Latino GOP PAC are the gatekeepers to the conservative Latino Community, for far too long GOP outreach to Latino Community has been minimal at best. Statements like “Latino’s don’t vote” and “Low Voter Turnout in the Latino Communities” are quickly becoming a thing of the past. Our communities are coming together for change. Our communities are rising to the challenge and demanding a more inclusive government. 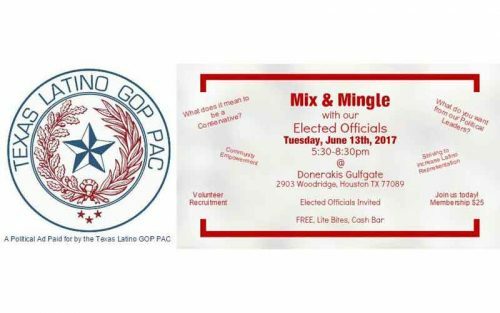 Join the Texas Latino GOP PAC; the heartbeat of the Latino Community today for updates and info on events and important issues impacting the Latino community, and join us this Tuesday at our next event. Our events are a grass roots initiative to join our elected officials, with their constituents, Latino Community gatekeepers, and stakeholders. I’m always curious when I see various identity groups trying to make a foray into the Republican Party. This group (honestly, I don’t know who they are) is bold enough to state the obvious – they want to be the ‘gatekeepers’ to the Latino identity group. I find that interesting. In my humble opinion, the ‘gatekeeper’ mentality has hampered the growth of the Republican Party. I say that after observing Harris County Republican Party politics for a couple of decades. Maybe I’m wrong and the Democratic model (identity is more important than ideas or opportunities) is correct. At any rate, it will be a good opportunity for us all to see who is contemplating a primary run next year as a Republican. Funny how you only see some people every election cycle. >I’m always curious when I see various identity groups trying to make a foray into the Republican Party. I share your curiosity. The Texas GOP (in theory at least) stands for limited constitutional government, free markets, protecting the sanctity of human life, sovereignty, separation of power, integrity in government, safe streets, and the like. Do our our fellow Texans of Hispanic ancestry have some ethnically-specific interests separate and distinct from non-Hispanic Republicans? I chuckle when I imagine the outcry that would ensue. The Southern Poverty Law Center ($PLC) would quickly denounce it as a “hate group,” and demand would be made upon every Republican official in Texas to denounce such a PAC. While it may be funny in some eyes, look at the GOP and about all you find is “Anglos” but that is not a proper term at least not as proper as “Whites”. Quite a few whites do not like the term “Anglo” cause they ain’t Anglo. But I wonder why so many “Anglo” persons don’t think anything about adding hyphenations to Americans that are darker than “White”? Wonder why the Harris County GOP is making outreach to “Minorities”? Just as “Latino” and “Hispanic” are not proper racial categories since Latinos/Hispanics come in all colors. Cameron Diaz, Linda Ronstadt and Ted Cruz are Hispanic and white; Sammy Sosa is Hispanic and black; and Alberto Fujimori is Asian and Hispanic. Often the term “Hispanic” is juxtaposed as a racial category alongside “white” and “black” when what is really meant is “mestizo.” Sadly, political correctness has rendered it essentially taboo to conduct an honest conversation about race in public. >But I wonder why so many “Anglo” persons don’t think anything about adding hyphenations to Americans that are darker than “White”? So Manuel Barrera, I pose the question to you: do our our fellow Texans of Hispanic ancestry have some ethnically-specific interests separate and distinct from non-Hispanic Republicans? >do our our fellow Texans of Hispanic ancestry have some ethnically-specific interests separate and distinct from non-Hispanic Republicans? Besides being discriminated against to a far greater extent than those of us of Anglo descent? My brothers in law have all commented about how many times they were put up against a wall or on the ground by police, just for fun. They were never arrested, just hassled for stuff like sitting around a table in their front yard, or playing basketball in their driveway They all look like they are from Mexico, but are 4th generation native born Texans. I’ve never been put against a wall or on the ground, but I am an old fat white guy. One of my colleagues carries passports for himself and his family when he goes back to Eagle Pass to visit his folks. He was born here, and his mother is native born. He’s had police on 2 occasions ask him where he bought his “fake” drivers license. He did not get a ticket on either occasion, but was hassled for no good reason. Bill I don’t know what you mean by Hispanic ancestry? When does one stop being Hispanic? When I change my last name to Miller? Do I have to change my first name also? LULAC called themselves Latin American because they thought that if they were not Mexican they would be better liked by the White folk (guess they were wrong). Everything Ross wrote about has happened to me or someone I know. Here’s the thing. One of the primary reasons that the United States has prospered for the last 250 years or so is because we have had a shared identity, a shared idea of who we are and what we stand for. Certainly it hasn’t always been perfect, and there have been (and sometimes still are) horrendous injustices. Nevertheless, we have continued to try to move forward as a nation, to correct the injustices, and come together as a people. Unfortunately in todays world I’m not sure that this concept of a shared identity and unity of purpose is still true. As long as there are groups of people who are more invested in their identities as “Hispanic”, or “Gay”, or “Female”, etc. than they are in their identities as “Americans”, then we are going to continue to have major problems. And, if it continues, we will end up as a sad, pathetic, group of balkanized enclaves. And, greatness will have left us. Well Fat I find myself agreeing with you, cause I call myself an American but then you have people like Don Hooper who sees nothing wrong by writing “Your” people, or DanMan insulting my intelligence. I am an American why can’t so many people just quit hyphenating everyone that does not look white? I guess I am a fat-American at the time. Manuel, are you against us enforcing immigration laws? No, I am still waiting for them to enforce e-verify. I am against the way they want to do it because “Mexican” looking folks will be profiled and stopped while others will not. I quit buying expensive cars after too many stops when I was young. As the police officer told another, I stopped him because I thought he had stolen the car. Had just returned home from a two week vacation and looked very brown, like the construction workers. I quit taking vacations to the beach, also. e-verify? what does the city not cooperating with federal law enforcement regarding detaining illegal alien criminals have to do with e-verify? It’s fascinating how you can get so much intimate detail of somebody’s thoughts as they racially profile you and then blithely change your way of living to accommodate your definition of their perception of you. DanMan, how is the City not cooperating with the Feds? It’s not like the City is the agency holding the detainees, that’s on the County, and the County has pretty much turned over everyone the Feds have asked for. Which is fine, as long as there is a Federal warrant to go with the detainer request. If there’s no warrant, then there’s no grounds to hold the subject of the detainer once he or she has made bail on the local charge, or is not charged by the locals. If you were a County Sheriff, would you hold someone on the verbal request of some guy on the phone, or an email that purports to be legit? That’s not how it works in this country, or at least it’s not supposed to work that way. E-Verify Dan was how immigration was suppose to have been controlled, and it works to a large degree. Is it perfect of course not, nothing is. The county is the one that does the detention, not the city. Get arrested Dan and see where they take you. What you and others, some racists and or bigots, have no idea if you are is that you want police to stop “Mexican” looking people and ask if they are here legally. Why not allow traffic stops and make everyone wait and ask them the same questions? Of course you may get inconvenience that ain’t good cause you ain’t “Mexican” looking. Like searching babies and grandmas at airports. I am a darn good American and believe that if I have to inconvenienced then everyone else should. And you are right about, “It’s fascinating how you can get so much intimate detail of somebody’s thoughts as they racially profile you and then blithely change your way of living to accommodate your definition of their perception of you.” Keep writing I will get to know you better, by the way my name is Manuel Barrera.